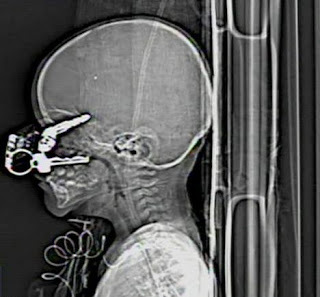 This brave little toddler has made an astonishing recovery after the horror of having a car key lodged in his brain. 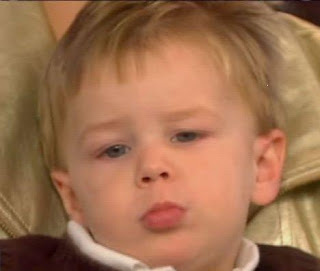 The freak accident happened when Nicholas Holderman, 20 months, was playing at home with his two elder brothers. 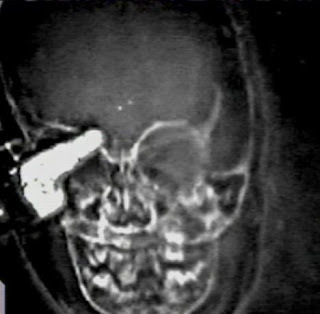 Somehow he managed to fall on to his parents’ car keys, one of which pierced his eyelid and penetrated deep into his brain as these X-ray scans reveal. Miraculously the American tot has since made a full recovery. Nicholas’s parents, who had been alerted by his screams, dialled the emergency services. And today the youngster appeared on American television with his family as they relived their ordeal. His father Chris Holderman said: 'Nicholas fell down and we heard him cry. It was different. Mother Staci Holderman added: 'I'll never forget that moment. Nothing can prepare you for something like that. The accident happened on September 2. His brother Isaac said: 'When I looked at it close I saw the key in his eye. 'It was a very horrifying sight to see this happen to your baby', dad Chris added. His mother made a frantic 911 emergency call after finding Nicholas with the key in his head. She told America's The Today Show: 'We knew that he was injured seriously. 'It was pretty horrifying. Not something I ever want to see again', said firefighter Chris Coffman, was one of the first on the scene after responding to the call. The youngster spent six days in hospital after being helicoptered to the medical unit. Doctors initially believed his right eye had been ruptured. Medics were able to remove the key during surgery without Nicholas suffering any damage to his brain. But then doctors found a quarter of an hour later that his eyesight hadn't been damaged after all. And now he has fully recovered and has perfect vision, his family says. 'Fifteen minutes later for another [doctor] to say nothing was wrong, we knew it was a miracle from the Lord', Chris added.